The hike was led by Sue McBean, Superintendent at Grandfather Mountain State Park and Hiking Coordinator for the Blue Ridge Chapter. We found lots of skunk cabbages (Symplocarpus foetidus) in bloom already! 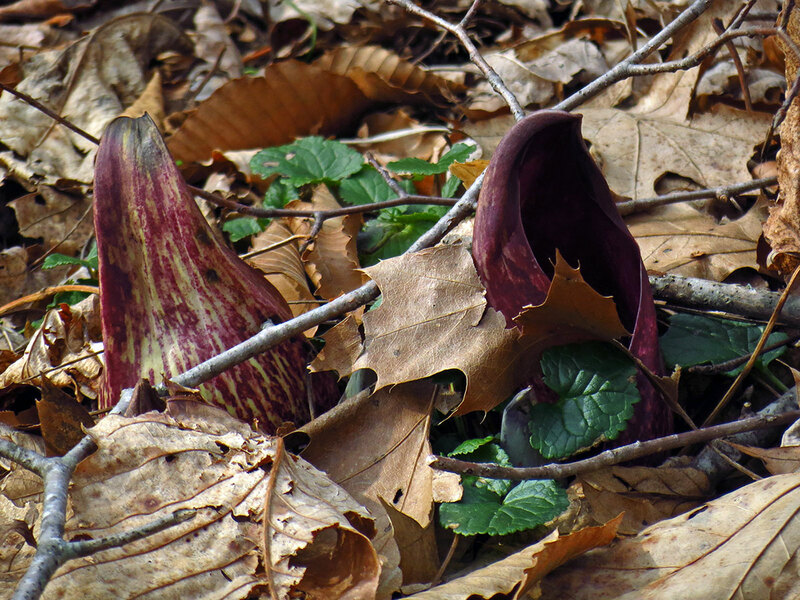 Skunk cabbage is a member of the arum family (Araceae) and as such has flowers arranged on a spadix inside a spathe. 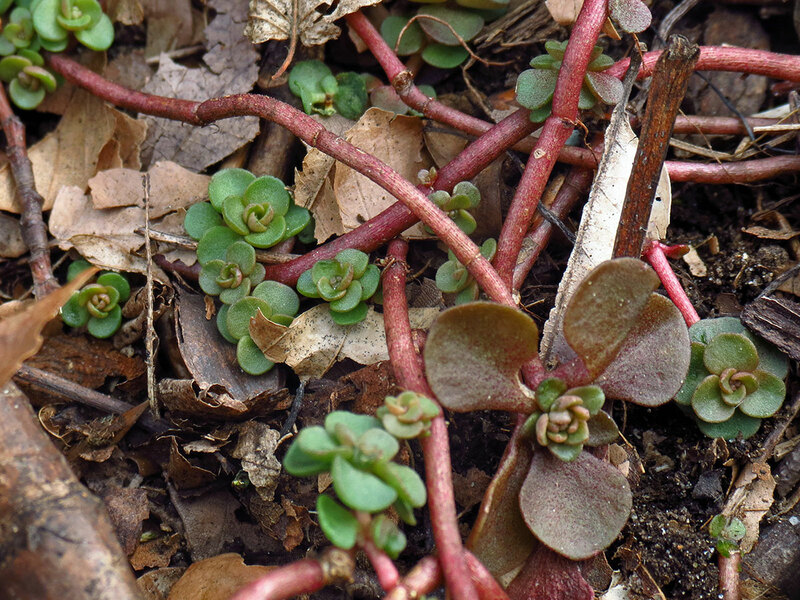 We also looked for evidence of other wildflowers and found Woodland Stonecrop (Sedum ternatum). 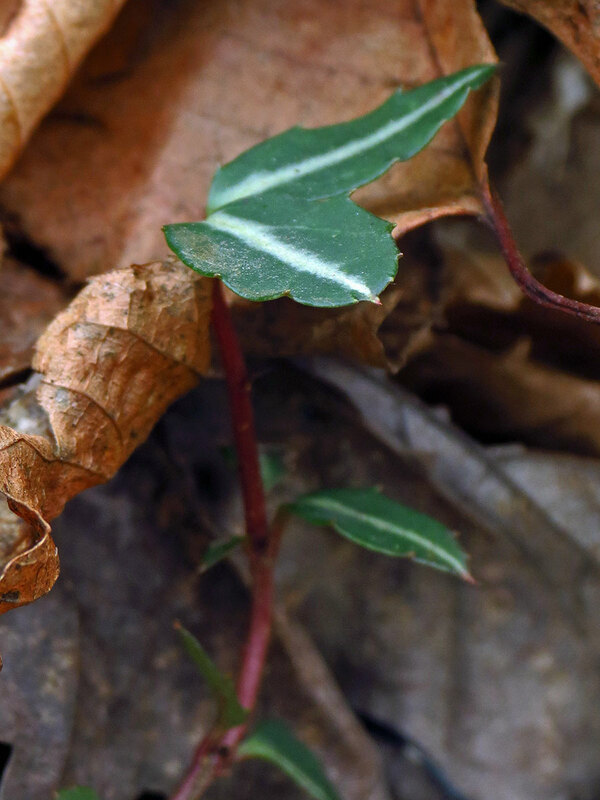 This is a wintergreen plant that keeps its foliage through the cold season although often the leaves will turn reddish in the winter. Eventually we hiked up into the beech forest. 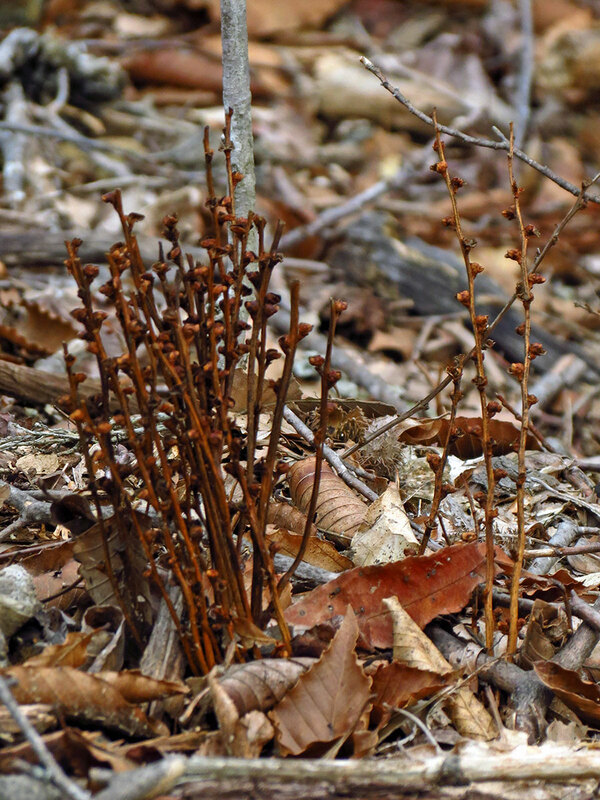 Beech Drops (Epifagus virginiana) could be found along the trail. 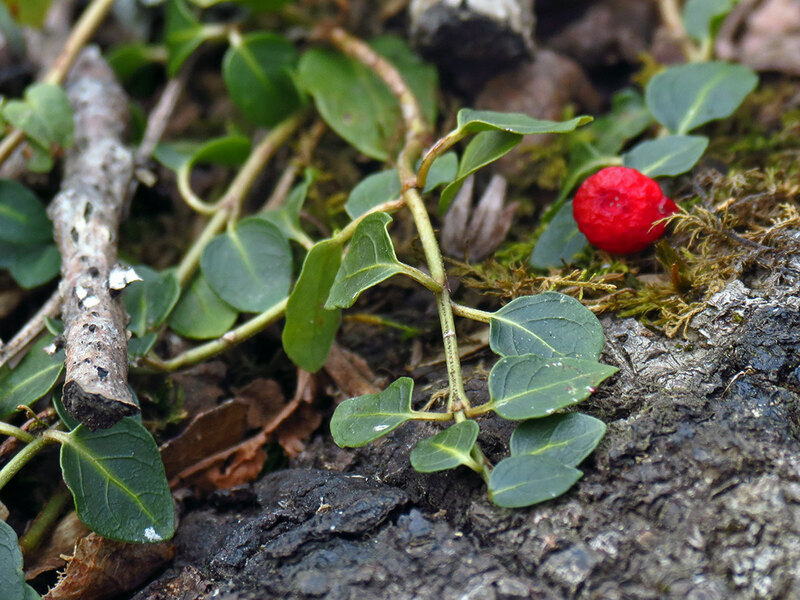 Another evergreen plant that persists through the winter, Partridgeberry (Mitchella repens) actually still had berries on it. 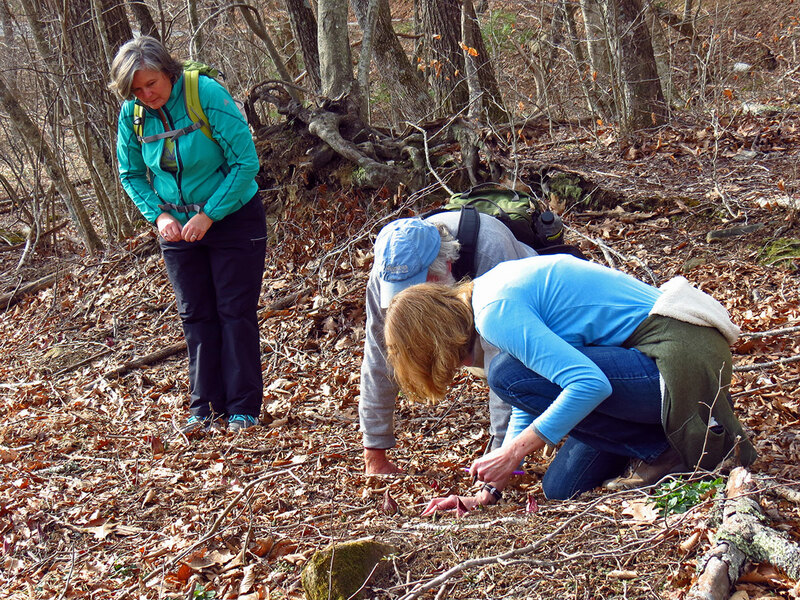 Spotted Wintergreen, also known as Pipsissewa (Chimaphila maculata), is another evergreen plant that we found along the trail. 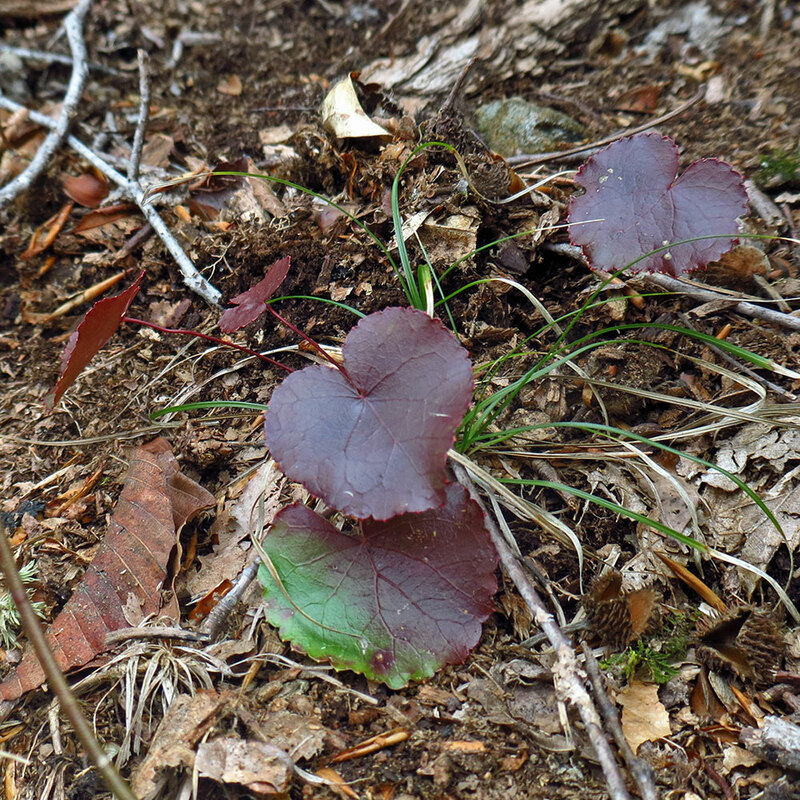 Galax (Galax urceolata) is another plant you can see turning its leaves red in the winter. 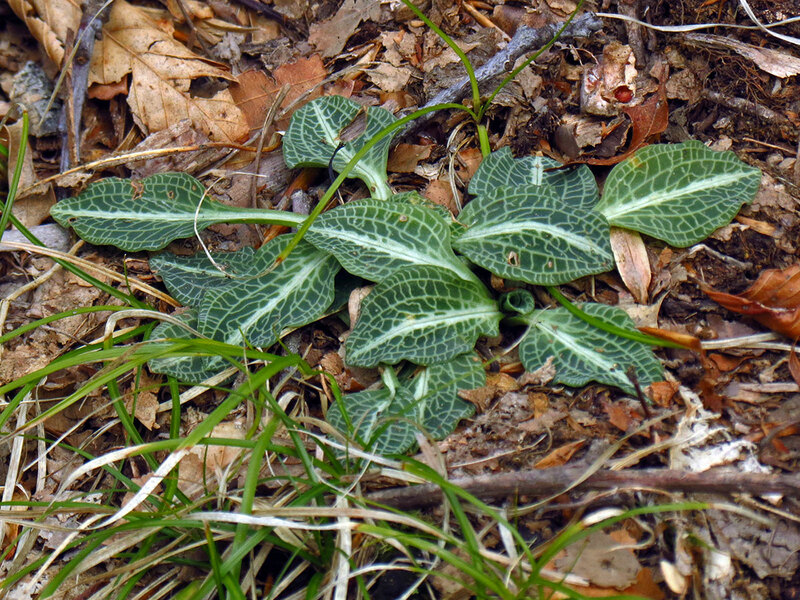 Downy Rattlesnake Plantain (Goodyera pubescens) was one of several orchids with wintergreen foliage that we saw. 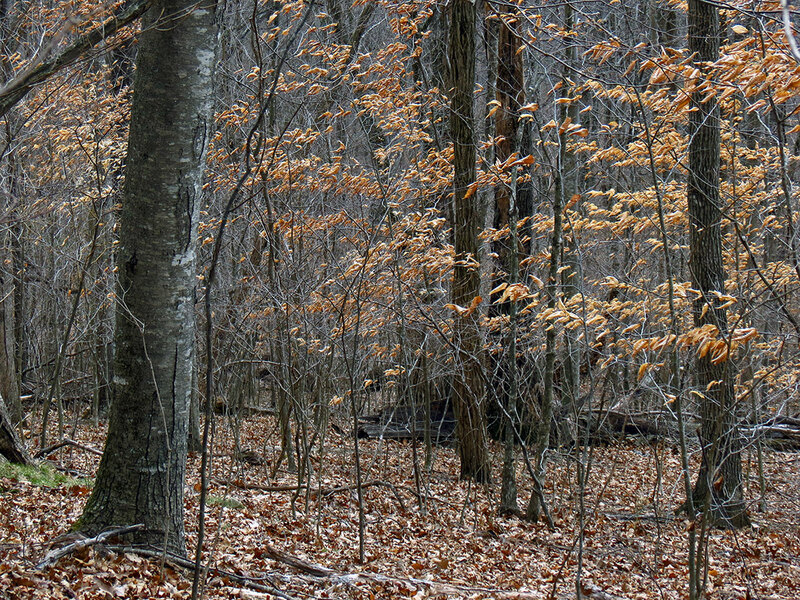 The fairly steep 2.5 mile trail winds up through a nice open hardwood forest with lots of beech and oak trees. Many of the trees were still holding onto last year's foliage. 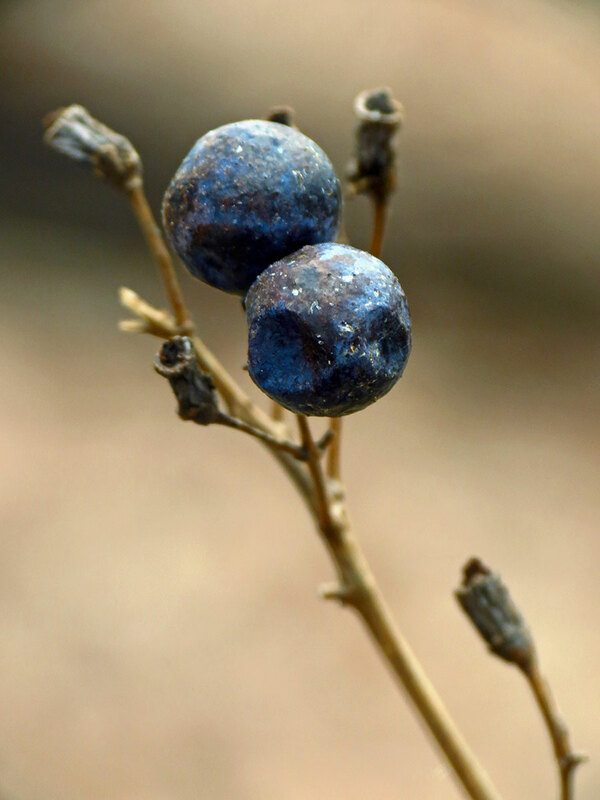 We found these berries at the top of the trail and decided that they looked like Blue Cohosh (Caulophyllum thalictroides). 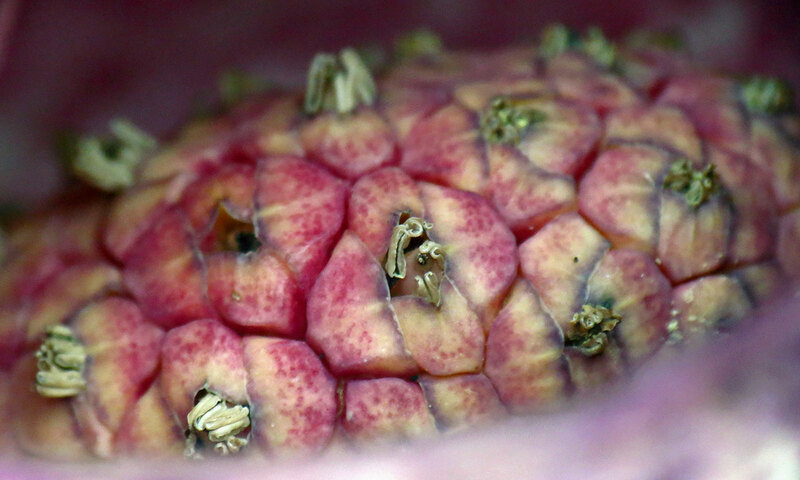 We were surprised they were still on last year's dried-up plants and hadn't been eaten by the birds or other animals. 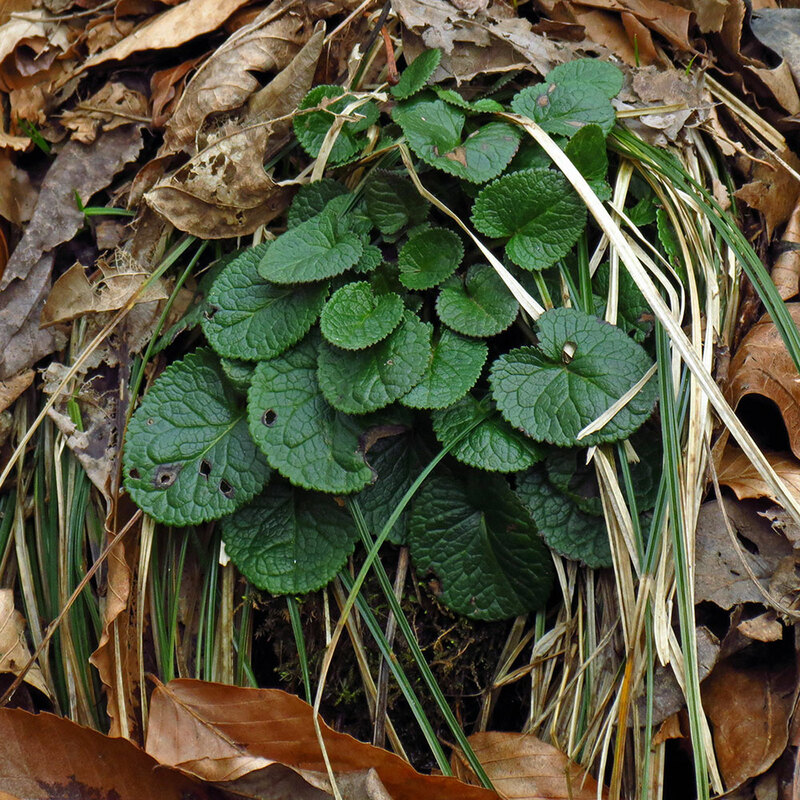 Another wintergreen orchid: Puttyroot (Aplectrum hyemale), still complete with last year's stalk of seed pods. 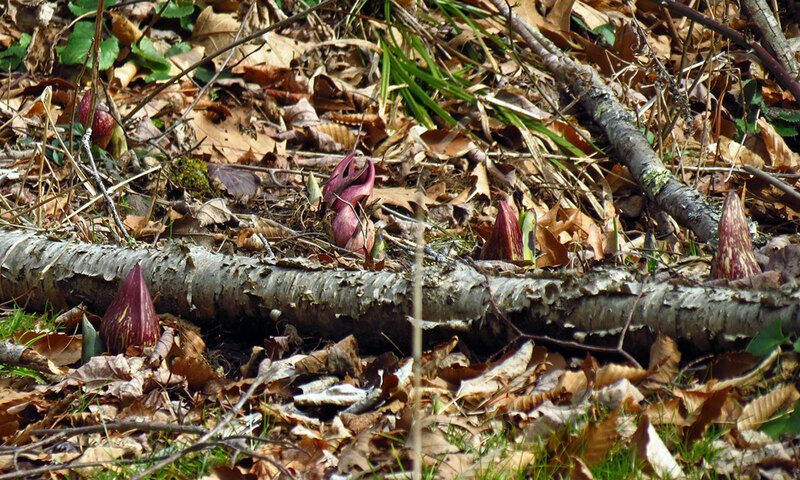 This is one of the orchids that put up their leaves over the winter and flower in the summer after the leaves have disappeared. These leaves belong to Golden Ragwort (Packera aurea, one of the spring bloomers. 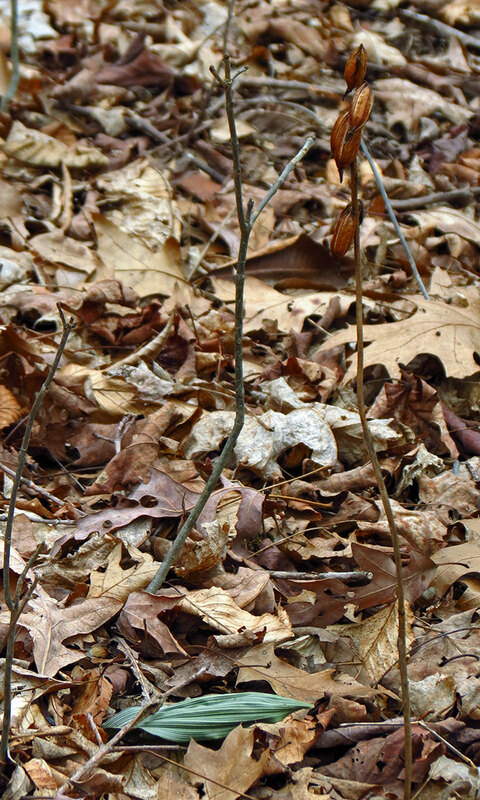 Their basal leaves are essentially evergreen through mild winters, such as the one we've had, but will disappear if winter weather is harsher. These were growing along the creek and looked quite healthy.